Changing your region to Mainland China will redirect you to our China Official Website. Changing your region to Taiwan will redirect you to our Taiwan Official Website. The extraordinary brilliance of an Infini Love Diamond is born of our pursuit of perfection. Only 0.03%* of the world’s diamonds will finally become Infini Love Diamonds. Our signature ‘Supreme Idea Cut’ takes to new levels of precision and beauty. Through painstaking cutting and polishing of all 57 facets, an Infini Love Diamond features a exquisite Hearts and Arrows pattern – representing the highest art of our Belgium Master Diamond Cutter. Every diamond has a natural colour. The more colourless a diamond, the more rare and precious it is. Natural diamonds often have slight inclusions, which can affect the way light plays upon the stone. Less inclusions means higher 'Clarity' and a more beautiful sparkle. Of the 4C standards, only the Cut depends on the craftsman's skill. 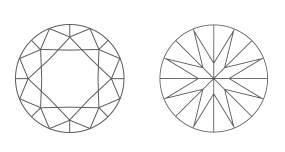 When a diamond's Cut (Proportions), Symmetry and Polish have attained superior levels of precision, light is optimally refracted - brining out the full brilliance and fire of a diamond.